Ready to make the great pilgrimage to San Francisco? Way back in the 60s, the counterculture of peace and love was all about packing up a van with as many other hippies as you could and heading to that exact place. On the way, they were sure to have some great pit stops where they enjoyed chill music, campfires, and braiding flowers into their long hair and beards. Those were the times, weren’t they? If only we could hop into our time traveling Volkswagen van and enjoy it all over again. It’d probably be a little better on the joints to be forty years younger too! 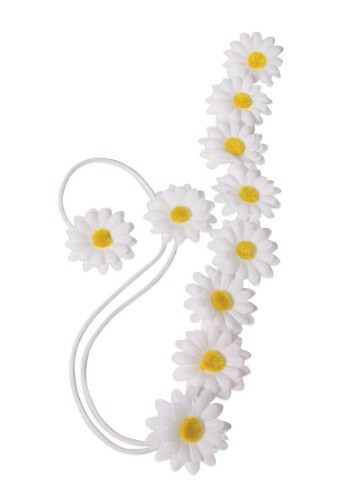 While you’re packing up to head back a few decades, be sure to put this wonderful Daisy Flower Headband on. It was all the rage back then, and we’d love to see it make a comeback. Not much of a time traveler? These are fantastic for your costume, or for the next musical festival you’ve been excited to attend since you heard about it! The daisies are hot glued onto an elastic band. I could have done that myself.